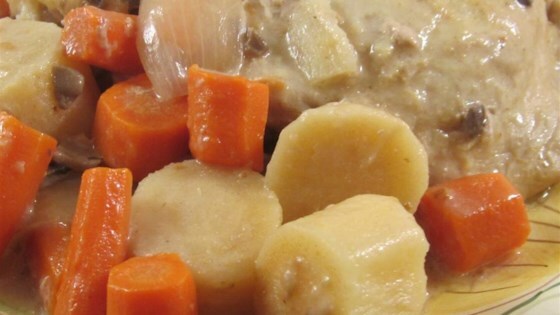 "Delightfully tender chicken cooked in a mushroom soup and yogurt sauce with root vegetables." Spread carrots, onion, and turnip into the bottom of a slow cooker crock. Arrange chicken pieces atop the vegetables. Season the chicken with salt and pepper. Stir mushroom soup and yogurt together in a bowl; pour over the chicken. Place the bay leaf atop the mixture. Cook on High for 1 hour. Reduce heat to Low and continue cooking another 7 hours. Made exactly as written. Was bland and watery. This was a very easy and tasty meal to make. I added 2 potatoes and used a bit more yogurt (about 9oz) and everyone loved it. Good base for a recipe, but a bit plain for my taste. I used all carrots and added garlic powder, rubbed sage, and an extra bay leaf and it was great. Substituted potatoes for turnips, added mushrooms. Then used chicken thighs instead of chicken breasts. The meat fell apart. IT was very simple to make. I ate it with and without rice but preferred it with the rice. This dish makes lots of vegs. to go around and does need more seasoning. We made this with boneless skinless chicken breasts.